Aconcagua (6961m) is the highest mountain in South America, one of the 7 Summits. It is located in Argentina in the Province of Mendoza. The name may have come from several possible origins: Kon-Kawa (“Snowy Peak”) - from the Argentine aboriginals, the Aymara; Aconca-Hue (“Coming from Other Side”) – from the Chilean Araucano; Akon-Kahuak (“Sentinel of Stone”) – from the Quechua. From the top of this mountain you can revel in the breath-taking views of the amazing white ranges of Cordillera de Los Andes. As a climbing objective Aconcagua offers a rich variety of interesting routes of all the technical levels. The Normal (or NW) Route is physically very demanding, but not really technical. Our expedition starts in the town of Mendoza. On arrival we go right away to Penitentes (a small village next to Puente del Inca) and on the next day the climb starts (by NR). We stay two nights in Confluenca Base Camp (3300m) and, for better acclimatization, two nights in Plaza de Mulas Base Camp (4350m). After that with the help of experienced guides and porters we begin to establish high camps: Canada (4900m), Nido de Condores (5500m) and Berlin (5900m). On the 12th day we make a bid for the summit. And of course we have a reserve day to make up for bad weather. The expedition ends in Mendoza, where we stay for one night before saying a hearty thankful good-bye to these places. 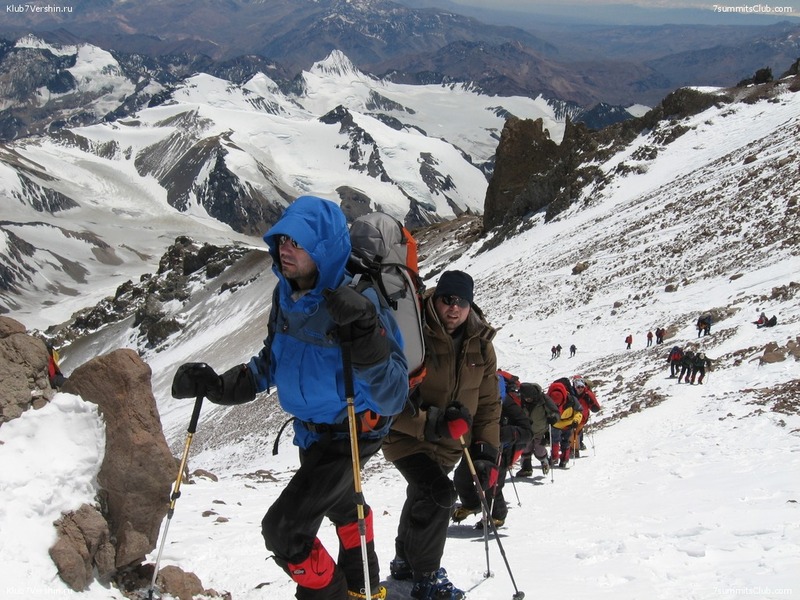 7 Summits Club on Aconcagua. 2004. Day 3 Transfer to the Penitentes (2700m, about 2-3 hours). Acclimatization up to 4000 m. Overnight stay in the hotel. Day 4 Transfer to the entrance of Aconcagua Provincial Park (Laguna Horcones) and a hike to Confluencia (3300m, 4-5 hours). Camp. Day 5 Long walk (8-9hr) to the main Base Camp at Plaza de Mulas (4350m). The way is along the wide valley of Playa Ancha. Camp. Day 6 Light acclimatization day in Plaza de Mulas (4350m). Sightseeing around the camp, easy ascent to the Orkones Glacier. Camp. Day 8 Rest day in Plaza de Mulas (4350m). Packing the loads to carry to higher camps. Day 9 Walk from Plaza de Mulas to Camp 2 (Nido de Condores, 5500m), a night there. Camp. Day 10 Descent to Plaza de Mulas (4350m). Camp. Day 12 Climb from Plaza de Mulas (4350m) to Nido de Condores (5500m), night there. Camp. Day 13 Climb from Nido de Condores (5500m) to Camp 3 (Cholera, 6000m). Camp. Day 14 Ascent of Mt. Aconcagua (6961m), descent to Cholera (6000m). Camp. Day 15 Reserve day in case of bad weather. Camp. Day 16 Descent to Plaza de Mulas. Camp. Day 17 Hike back from Base Camp to Laguna de Horcones. Bus transfer to Mendoza. Night in Mendoza. Day 18 Bus transfer to the airport. Flight from Mendoza. • Transportation in a private bus/minivan from Mendoza to Penitentes and back. del Inca (Los Puquios) to Plaza de Mulas and back. Our guide will have a first aid kit and we strongly recommend to bring your own specific medicines you might need. Besides, we recommend to start taking polyvitamins 3 weeks before the expedition. Also would be very useful to try to acclimatize on some peak over 5000m and test your system before you come to Aconcagua. Generally from December to March. Experience indicates that, if the "peak" months are the coldest, its climate is more stable. It would be good to calculate correctly the time you have available, including some days of "reserve" to wait for good weather in case of storms. A "bonnet of smoke", white wind over Aconcagua`s top, is a sign of tempest in the heights and you must not go further on. Book, playing cards, walkman, reading stuff etc.